Google play has become a host for over three million apps and games, which makes the task of finding the right game for us more and more difficult. Even then, finding a good game isn't enough, because of the almost endless amount of games. Sometimes, what makes a good game great, is its uniqueness. 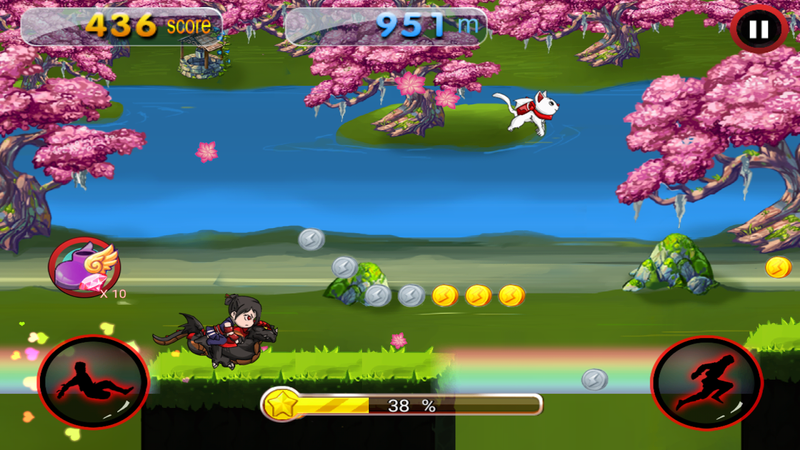 Which is why we would like to share with you our latest find, a relatively new game called Dragon Ninja Rush, a platform game that even though shares attributes with similar game, still manages to deliver quite a special gameplay and gaming experience in general. How does it do it? Well folks, just read on. 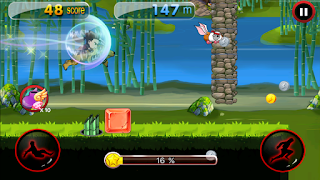 Dragon Ninja Rush is a platform game and as such has all the elements that make a good platform game. 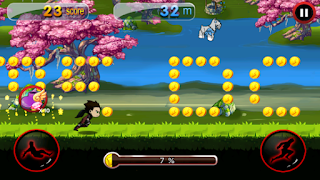 Our hero is an interesting character, a martial arts expert who must use his physical prowess to hoard riches and defeat his enemies, while getting the best scores and fastest results. As a ninja, our character can jump, slide, rush, fight, dodge and scramble in order to survive the hostile and fantastic environment he finds himself in. Not only must he survive deadly traps, some exploding while others just slice, crash and mince, there are also horrible enemies who all must be defeated in order to achieve victory. Well, people might say, What makes this so special? We DID see platform games before. Well, there are mainly three things that set this game apart. First of all, the controls. 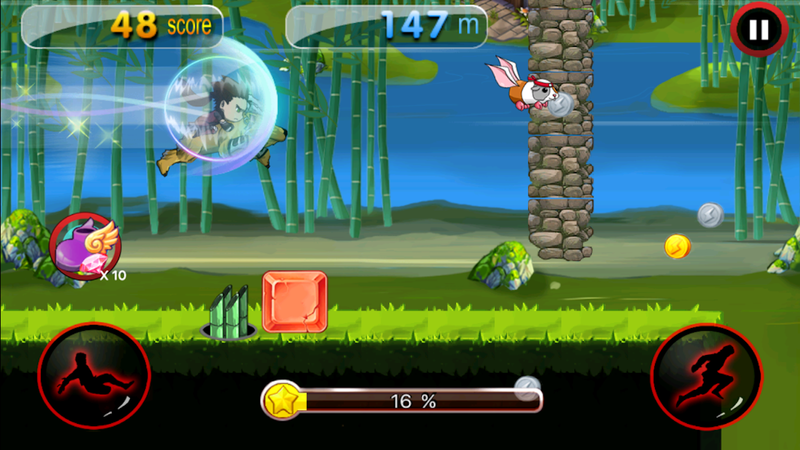 Dragon Ninja Rush has intuitive controls that actually makes the player feel as if HE or SHE is right there inside the game, running and using ninja skills to survive. The second thing is the sheer diversity and richness of the game. Dragon Ninja Rush is one of the most rich and feature filled games we have ever seen, from the skill levels of our here himself to the sheer number of traps, enemies and environments that the game possess. The last but certainly not least thing is the graphics. Every thing is alive, moving and painstakingly drawn with vibrant colors to deliver a gaming experience that is really different from most other platform games. 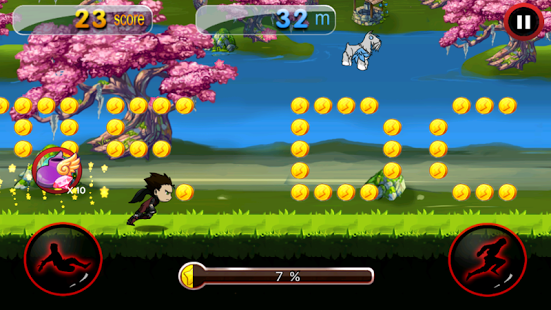 To sum things up, Dragon Ninja Rush is a platform game in which the studio really put in an effort to make something different, a game that people will like.